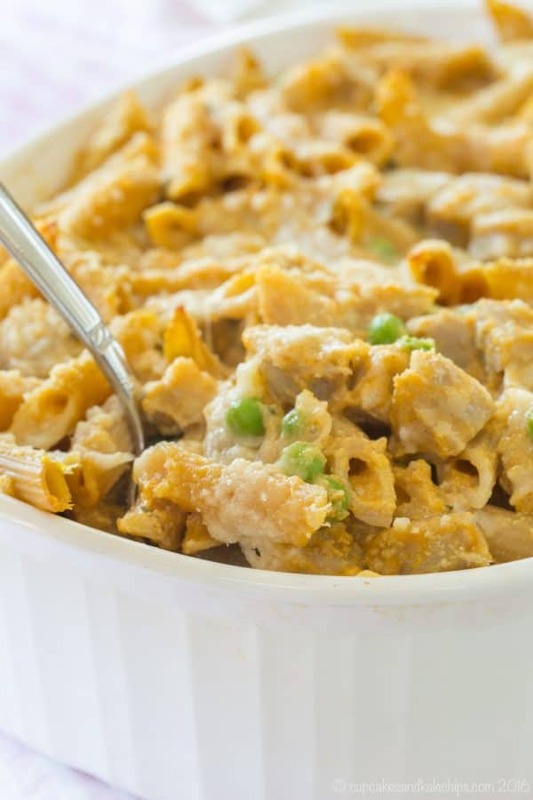 A hearty, healthy, and comforting fall pasta casserole recipe. 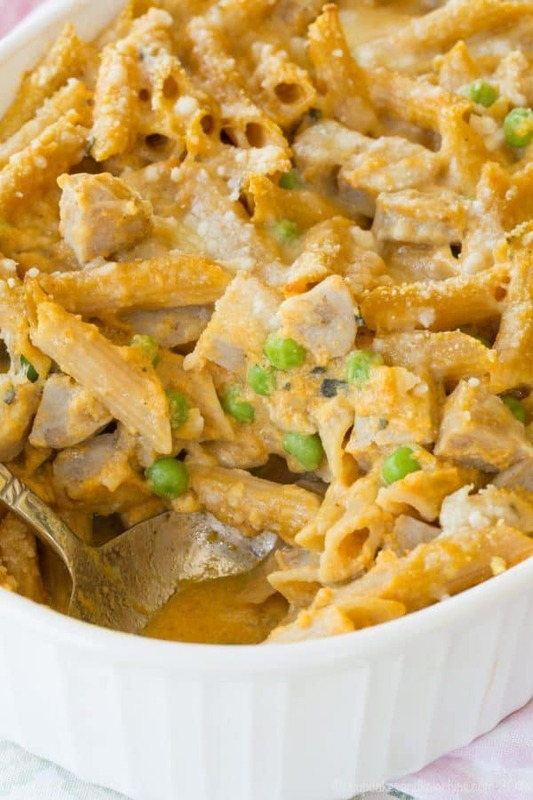 Baked penne pasta with pumpkin cream sauce and chicken sausage is a fall comfort food dinner. 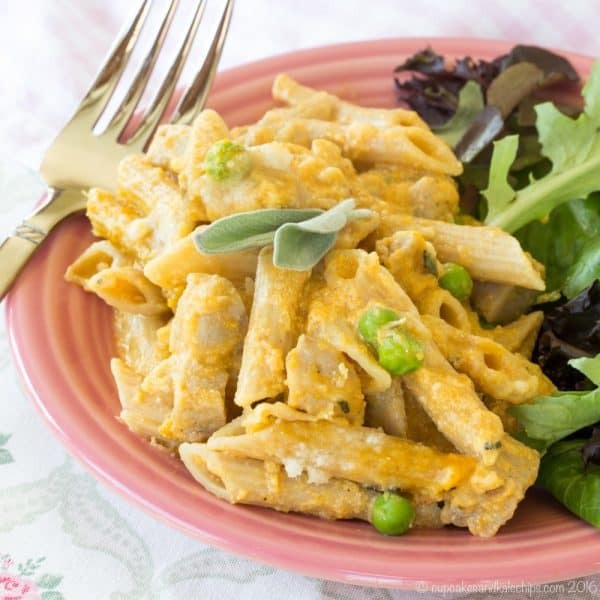 This is one of the best gluten-free pumpkin recipes for an easy weeknight dinner! 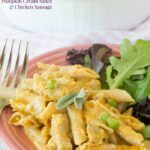 For many reasons, October is a time to comfort others, and my way to do that is through comfort food, like this creamy and satisfying fall casserole recipe, Baked Penne with Pumpkin Cream Sauce and Chicken Sausage. Disclaimer: This recipe was developed through a sponsored partnership with al fresco all natural. As always, all opinions are my own. Cancer has certainly made its presence known in my life this year. I haven’t been immune to it in the past, losing my uncle and father-in-law, among others. But this year it’s hit pretty hard, not only me personally, but others I know, especially young, vibrant, healthy women. I had my own thyroid cancer scare, which luckily turned out well and one of my best friends recently went through treatment and is in remission from Hodgkin’s Lymphoma. Then of course, especially as we enter October, which is Breast Cancer Awareness Month, I have to reflect on the women in my life that have been impacted by this disease in just the past year. One of my blogging friends and my high school chemistry teacher both had suspicious lumps that were biopsied, and though fortunately both turned out to be benign, it was an extremely stressful process to get that clean bill of health. I have another friend whose mom and sister were recently diagnosed with breast cancer, so now not only is she concerned about them, but she has to go in for genetic testing to see if she is at a higher risk. The sister of my college roommate has spent the year dealing with multiple treatments and complications. My stepdad’s stepmom and stepsister have had surgery this year to treat breast cancer. Another of my blogging friends, one of the healthiest, most fit, active, and athletic people who has such a balanced approach to nutrition and life recently had a mastectomy and breast reconstruction, and she just received her clean bill of health and clearance to return to her usual workouts. And then there is this story. I recently just started getting to know a woman in my neighborhood who has two children. She has metastatic breast cancer and was diagnosed when she was pregnant with her daughter. As I said, I don’t know her too well, but after seeing her at the pool this summer and the bus stop this fall, I assumed that things were, well, as good as could be expected while managing this terrible illness. 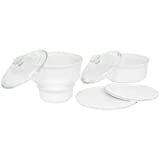 Then literally as I was halfway through writing this post and planning to talk to her about being able to bring them dinner one evening, just to lighten her load a little, I went to pick up my son from the bus stop. Her husband was talking to some of the other ladies in the neighborhood, and I found out that after a few dizziness and falling spells recently, they found out she has a lesion in her brain, and is now starting a new round of treatments for this new metastasis of her cancer. My tray of baked penne pasta is temporarily on hold. This happened so suddenly that I think they are in the mode of just getting through one day at a time, and aren’t quite sure what they need and when. She and her husband are both following different but fairly strict diets, but we are hoping we can at least provide dinners for the kids, take on the grocery shopping, walking the kids to and from the bus, and opening our homes to after school and weekend play dates – basically whatever they need. Once things settle in (“settle in” being a relative term, as far as cancer goes) with the routine of this new treatment protocol, we in the neighborhood are going to try to coordinate any way we can help the family. You guys, I’m just one person, and these are the recent stories I can rattle off the top of my head. That’s why October is so important not only to bring awareness towards finding a cure, but to promote health and wellness for every mother, daughter, aunt, sister, grandma, best friend, neighbor, and person (yes, men can get breast cancer too) out there. Plus it is also a reminder to think about the women in our lives who are currently struggling with this illness. That’s why al fresco brought together Team Pink – to help #fightbackbetter. 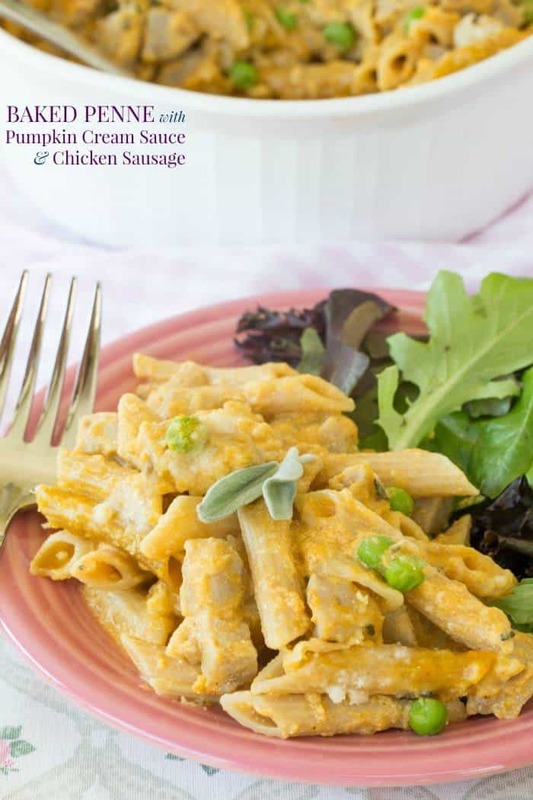 Baked Penne with Pumpkin Cream Sauce and Chicken Sausage is hearty and comforting, with all the best flavors of fall from the hint of pumpkin in the sauce to the bits of apple in the al fresco Sweet Apple Chicken Sausage. It’s the perfect balance of sweet and savory, as well as healthy with just the right amount of creamy indulgence. It’s starts with a whole wheat or whole grain gluten free pasta (I like ones that are quinoa-based). The al fresco sausage provides protein and amazing flavor without any gluten, nitrites, nitrates, preservatives or artificial ingredients. 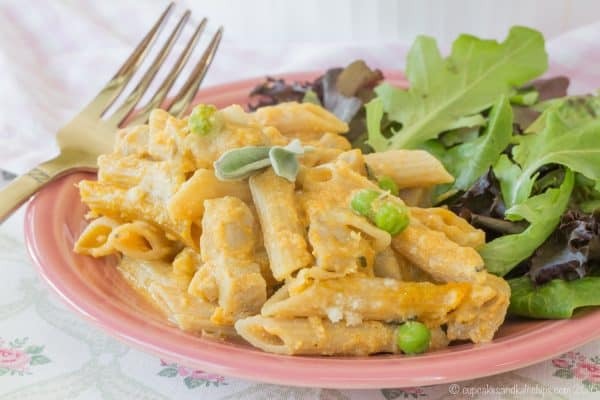 Then, instead of a heavy cream-based alfredo-style sauce, this one uses half and half and chicken broth, with the extra creamy factor, plus fall flavors and added veggies, from stirring in pumpkin puree. A few peas for color and a bit of green goodness and a sprinkle of cheese on top and you have a family-friendly casserole. 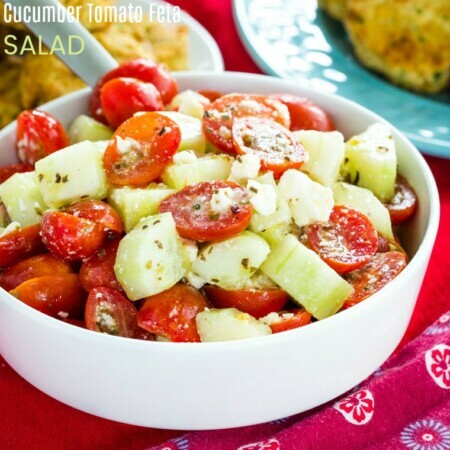 Paired with a salad or steamed green beans, this meal is perfect for an evening when the air is crisp, like in October. Speaking of October, let’s get back to Breast Cancer Awareness Month, and this baked penne pasta recipe! al fresco has brought together Team Pink, a group of bloggers and influencers who will work together to remind others to fight back against breast cancer by identifying someone in each of our lives battling this illness and do something for them. Bring dinner, offer to do some chores for them, take them out for a special day or meal, send a card or care package, anything to make their day better, brighter, or easier. And even if you don’t know anyone nearby for whom you can cook a good meal, you can still help al fresco send a meal to a family in need. 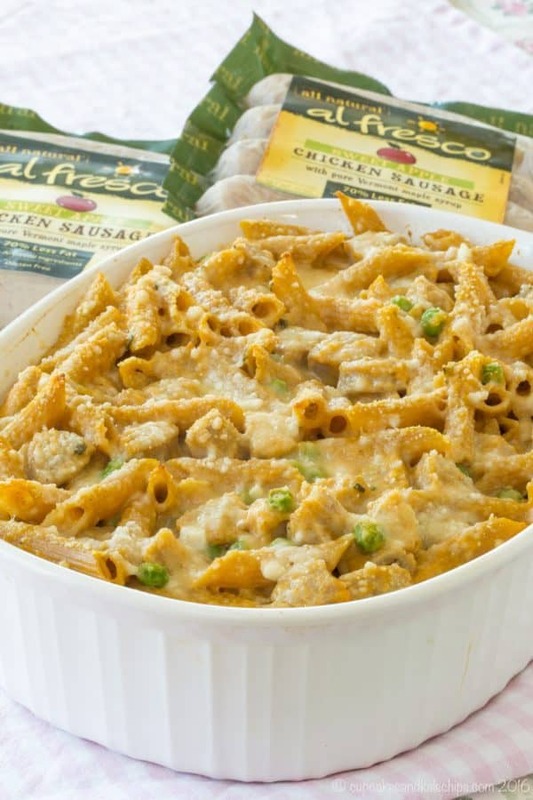 You can share this recipe or another healthy meal you make using al fresco chicken sausage, or any other way you are going to fight back against breast cancer, like donating to a charity, participating in a local walk or other fundraiser, getting regular exercise, or going for your regular screenings, on your Instagram or Twitter account, tagging @alfrescogourmet with the hashtag #fightbackbetter. For every use of the hashtag, al fresco will donate one meal to the family of someone fighting breast cancer through The Ellie Fund. I just heard about The Ellie Fund through this campaign, and could not be more thrilled to be supporting such an incredible cause and the amazing work they do. The goal of the Ellie Fund is to provide day-to-day support to breast cancer patients so they know their families are being taken care of, and they can focus on their healing and time with their families. This means providing transportation to and from treatment, light housekeeping, gift cards to local grocery stores, and, as I mentioned, providing nutritious meals to these families. Patients just need to work with their oncology professional to apply to receive one to three months of services during their treatment. 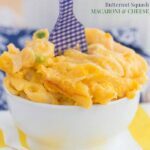 I bet this baked penne pasta dish would be perfect for someone in need of comfort. Look around you. If breast cancer has impacted so many around me in such a short period of time, I’m certain there is someone in your life. Just offer to help. Whatever they need. 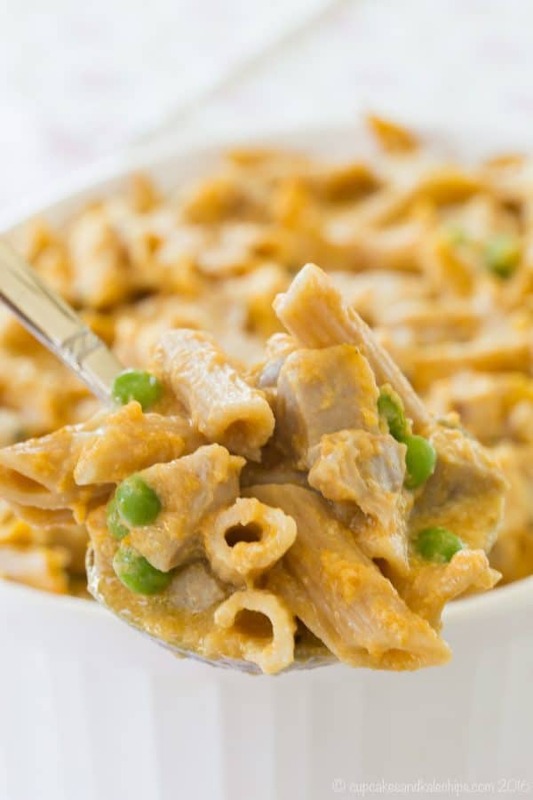 Even if it’s as simple as bringing them a tray of baked penne pasta with pumpkin cream sauce and chicken sausage. Preheat over to 350°F, and coat a 2 quart casserole dish with cooking spray or oil. 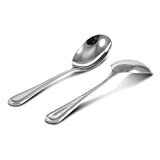 While preparing the sauce, cook the pasta to al dente according to package directions, drain, and set aside. To prepare the sauce, melt butter in a large, shallow saucepan over medium heat, and add the garlic and sage. Cook for a couple minutes to allow the flavors and aromas to release. Add the half and half, chicken broth, pumpkin, and nutmeg. Over medium-low heat, bring to a summer and cook several minutes until thickened slightly. Stir in 1/2 cup parmesan cheese, salt, and pepper. Remove from the heat. Add pasta, peas, and sausage to the sauce and stir to coat completely. Transfer the pasta to the prepared casserole dish, and sprinkle with remaining 1/4 cup parmesan cheese. Bake in the preheated oven for 20-25 minutes, or until heated through, and lightly browned on the top. 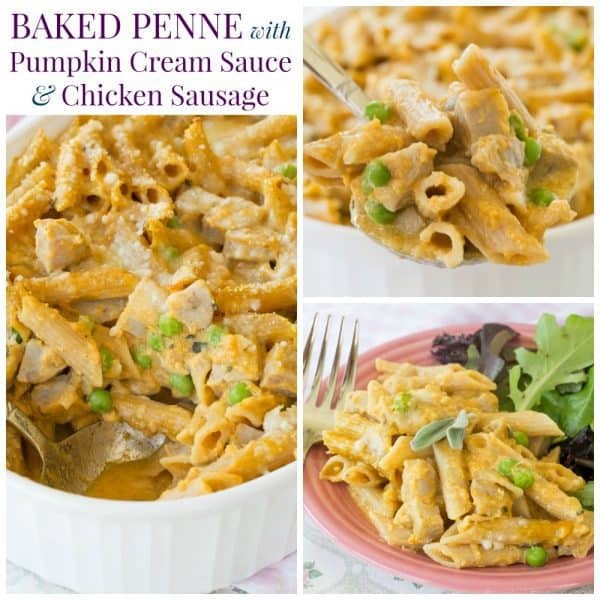 Enjoy this Baked Penne with Pumpkin Cream Sauce and Chicken Sausage recipe! 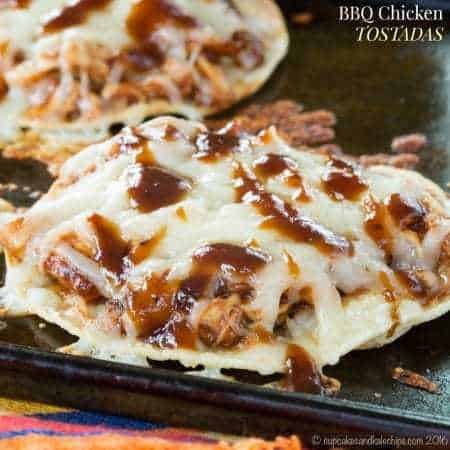 It’s really hard to find good, simple recipes online but this one is a keeper. The sausage is a little overly sweet but that was my only complaint and it’s easy to fix. I’ll just try different brands of this kind of sausage. We didn’t have sage so we used fresh thyme instead and I subbed cinnamon for half of the nutmeg. Came out wonderfully. 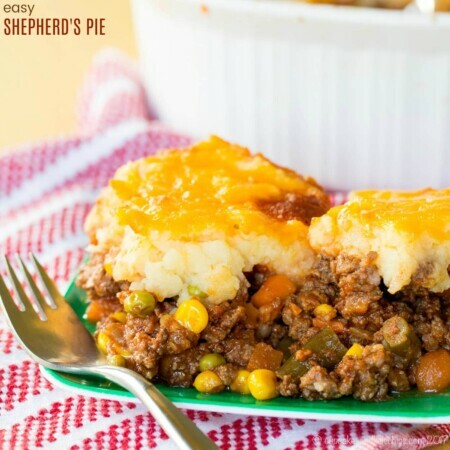 I’m so glad to hear that you enjoyed the recipe and found ways to make it work with what you had on hand! That really looks good! I love sage, soo tasty and those sausages are really good. 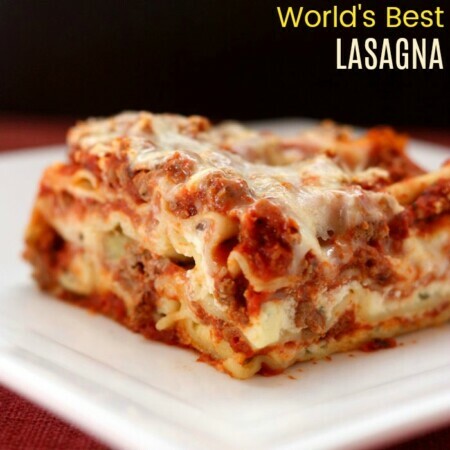 I am looking forward to making this recipe! My mom had breast cancer when I was just 9 years old. Thankfully she had surgery and recovered completely without any repeat incidents. It is crazy how many people cancer affects. I love the call to action to help out those around us. And I love that creamy pumpkin pasta. 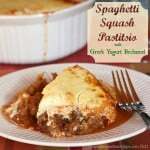 What a great recipe for the fall months! Oh Jocelyn, I am so happy she has such a great story of recovery, and can’t imagine what it must have been like for you too, at such a young age. It is such a horrible disease and I hope one day nobody has to worry about it anymore. In the meantime, it is so important to do what we can for those around us. Love this original idea! Perfect for the Fall. Pinned! I love when pumpkin goes savory! What a dream dinner! Thank goodness that your scare turned out well! And it’s great that you’re trying to help out your neighbor. I’m sure those meals will be most appreciated! I’m sure they’ll love this. It looks delicious! This looks absolutely delicious! And I love the support for those struggling with breast cancer. It’s been almost 9 years since I lost my mom to breast cancer and it’s still a cause that’s near and dear to me. Thank you!! It is definitely a cause important to me and so many others, but I am sure it will forever be close to your heart. It’s only a small thing, but all of those small things can add up together! This looks absolutely delicious! I will be making it soon! !